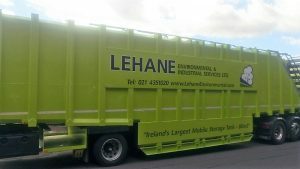 Lehane Environmental is a leader in Ireland providing innovative mobile storage tank solutions ranging from 4,000 ltrs UN Tanks to the impressive 86,000 ltrs. Our 86,000 ltrs mobile storage tanks are the largest mobiles storage tanks available in Ireland and can also be supplied bunded. This offering is exclusive to Lehane Environmental. Whilst the 86,000 ltrs tanks have significant storage capacity they only occupy the same footprint as a standard 30,000 ltr road tanker. Our tanks which can be used to store a wide variety of products and wastes are mobilised from our Cork Depot and can be dispatched throughout Ireland at short notice. Our Storage Tanks provide for the storage of liquids in large volumes with a small footprint and maximum flexibility. Our diverse range of Storage Tanks support almost any application and liquid, whether you need liquid containment, heating, mixing, separation or extra environmental protection. 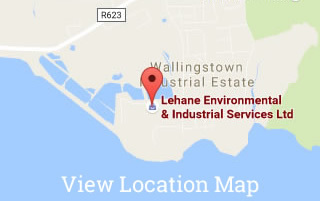 Combined with a complete range of ancillaries, Lehane Environmental is uniquely equipped with an unmatched inventory of tanks and accessories. Our mobile tank solutions are ideal when you are planning a refurbishment project such as a Balance Tank, Interceptor Tank, Aeration Basin etc. 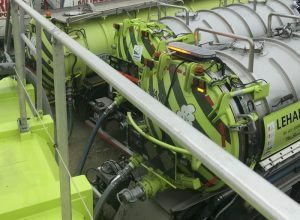 Lehane Environmental can provide a turnkey service where we can replicate your permanent system during the refurbishment project thus allowing you to continue your normal operations. This can often be the determination on whether a project can proceed or not. Lehane Environmental are highly experienced in the provision of these projects and we can also provide for the actual tank refurbishment in our package. Lehane Environmental have a large fleet of UN Tanks (ISO Tanks) approved for the carriage of Dangerous Goods (Class 8, 3, 6.1, 9). The storage tanks are available for either storage on-site, transport in Ireland or export to overseas waste facilities. Storage tanks are available with various specialist requirements such as rubber lining, heating coils, food grade, stainless etc.